From the acclaimed military historian, a new history of the outbreak of World War I: the dramatic stretch from the breakdown of diplomacy to the battles--the Marne, Ypres, Tannenberg--that marked the frenzied first year before the war bogged down in the trenches. 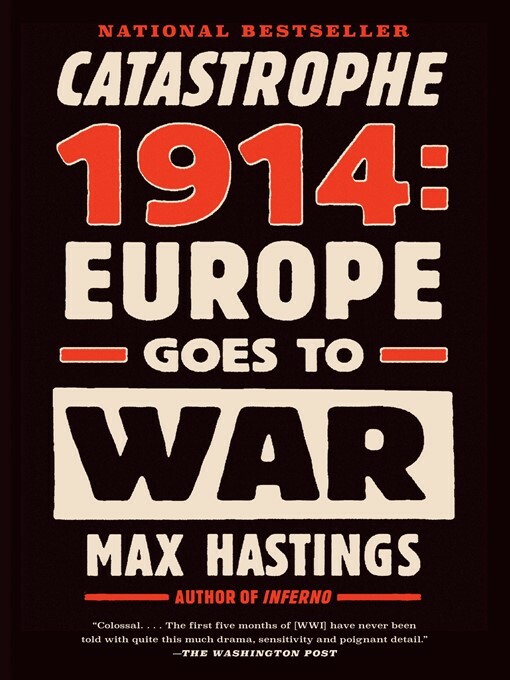 In Catastrophe 1914, Max Hastings gives us a conflict different from the familiar one of barbed wire, mud and futility. He traces the path to war, making clear why Germany and Austria-Hungary were primarily to blame, and describes the gripping first clashes in the West, where the French army marched into action in uniforms of red and blue with flags flying and bands playing. In August, four days after the French suffered 27,000 men dead in a single day, the British fought an extraordinary holding action against oncoming Germans, one of the last of its kind in history. In October, at terrible cost the British held the allied line against massive German assaults in the first battle of Ypres. Hastings also re-creates the lesser-known battles on the Eastern Front, brutal struggles in Serbia, East Prussia and Galicia, where the Germans, Austrians, Russians and Serbs inflicted three million casualties upon one another by Christmas. As he has done in his celebrated, award-winning works on World War II, Hastings gives us frank assessments of generals and political leaders and masterly analyses of the political currents that led the continent to war. He argues passionately against the contention that the war was not worth the cost, maintaining that Germany's defeat was vital to the freedom of Europe. Throughout we encounter statesmen, generals, peasants, housewives and private soldiers of seven nations in Hastings's accustomed blend of top-down and bottom-up accounts: generals dismounting to lead troops in bayonet charges over 1,500 feet of open ground; farmers who at first decried the requisition of their horses; infantry men engaged in a haggard retreat, sleeping four hours a night in their haste. This is a vivid new portrait of how a continent became embroiled in war and what befell millions of men and women in a conflict that would change everything.